This year saw our first homebred filly born on June 13th 2013 Quiri AKA (Donnerhalls Daiquiri). Dam It’s Cointreau x Sir Donnerhall Dam Sire IT’S THE BUSINESS. 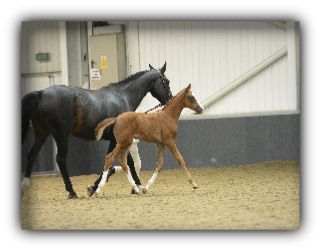 On August the 16th 2013 we took both mother and daughter to our first British Equestrian Federation Futurity (BEFF) up at Keysoe EC whereby we were delighted to have gained an ELITE Premium and finishing 8th in the overall leader board in the dressage foal section. A promising start to our breeding of potential international horses for the future…..